Since both my husband and I sing in our church choir, Holy Week is full of rehearsals and church. Last night, we remembered the Last Supper and celebrated communion for Maundy Thursday. As I was preparing my daughters for our church-filled week, I reminded them of the Tenebrae service we attend on Good Friday. The lights slowly go out until we are sitting in darkness. The slamming of the Bible, which was open at the book of Isaiah, symbolizes that the prophecy has been fulfilled when Jesus dies on the cross. The Tenebrae service was always one of my favorite church services when I was growing up. I’m so pleased that my daughters can take part in this church tradition. Our church has also started a new tradition: a tomb stands in front of the church, and a stone will be rolled in front of it later today. 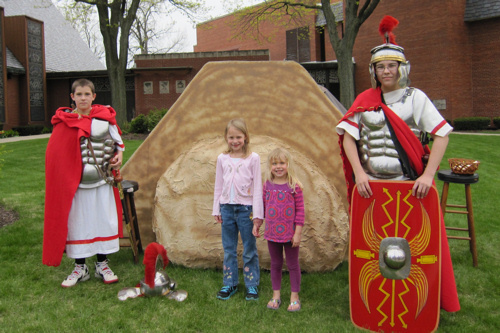 Of course, Lily and Emmy are also looking forward to the traditional Easter egg hunt tomorrow! 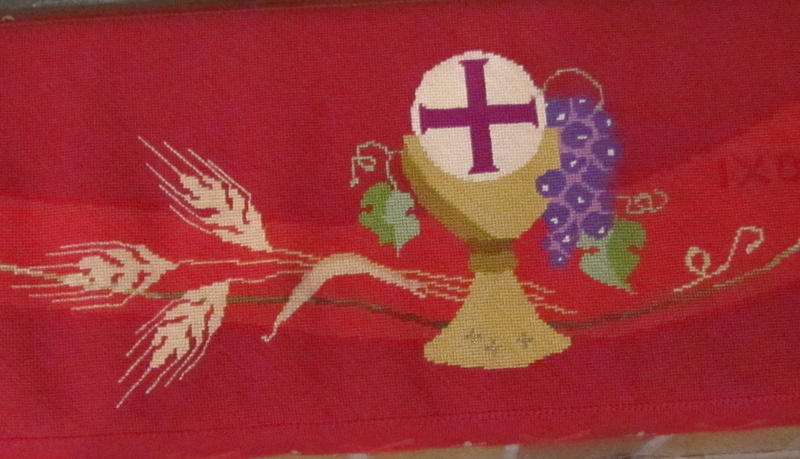 Note: The needlepoint pictures are from the communion rail kneelers at my church. 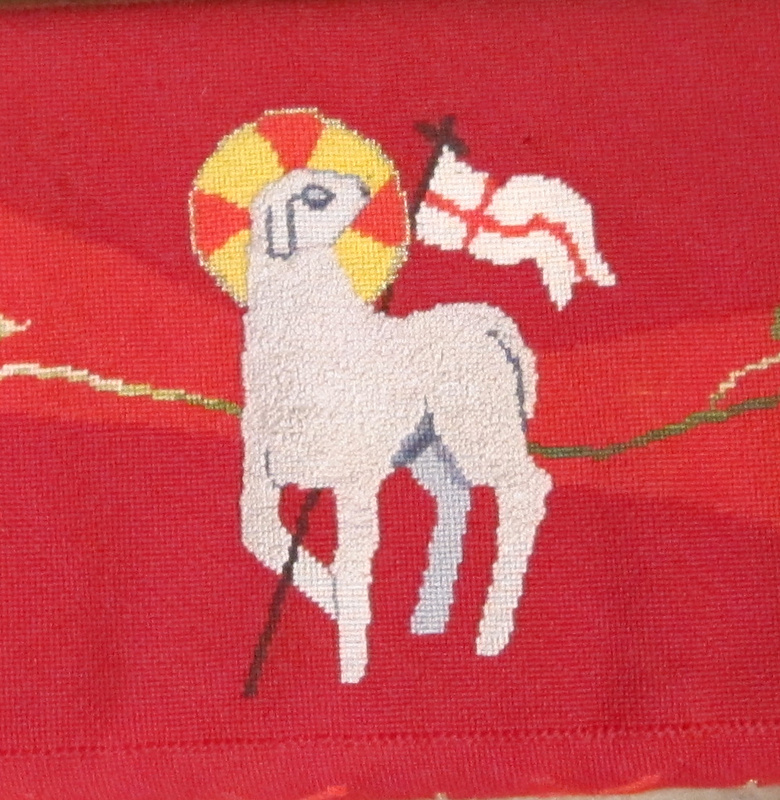 They were designed by my mom, and many faithful members of our church completed the needlework on these kneelers. Many of them (including my mom) are now in their heavenly home. Not only are they a wonderful reminder of our faith, but also a memory of the saints who have gone before us. Such a cool tradition! This was my first Easter without an Easter basket or ones for my kids. To be fair, we're celebrating Easter next week with my parents. Oh, and I'm Jewish. I still grew up celebrating though! My husband I met at church as well. I hope that our church takes on a more active presence during Holy Week. It seems that we're missing so much! Church is a great place to meet a husband, isn't it? 😉 Happy Easter! Sounds like a lovely tradition. Happy Easter! Love the tomb and the soldiers…. What a neat tradtion! I'm with you! Holy Thursday mass, Good Friday service (three hours! 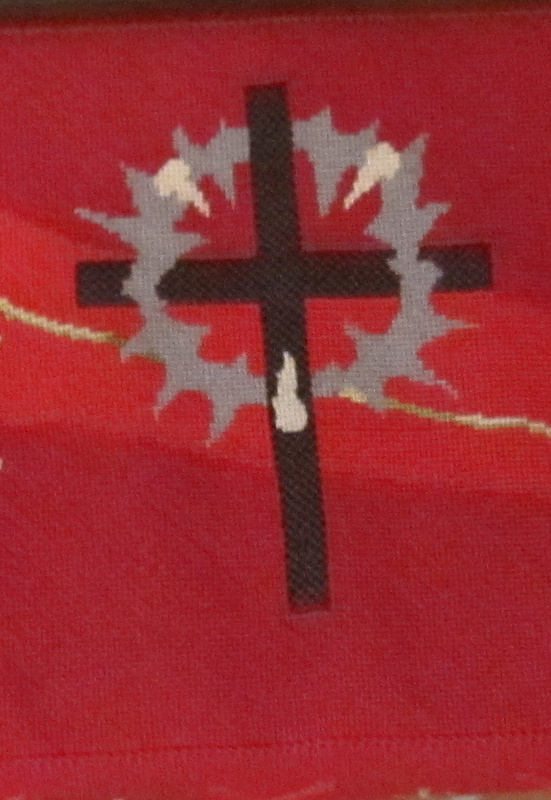 ), Holy Saturday Easter Vigil, Easter Sunday morning! Holy Week is a whirlwind for me! Have a beautiful and blessed Easter Ginny! It definitely is a whirlwind! Happy Easter, Gretchen! I don't remember much of an Easter tradition we had. Apart from eating tons of boiled eggs on Easter morning that is. Other than that it was church on Easter morning (after the eggs) and that's it. Maundy Thursday was never a day celebrated in the Netherlands, although it seems to be here in Norway, albeit spent skiing for the most part! Ed would like the skiing part of Maundy Thursday! That's something I've never heard of before! That's so cool that your mom made the kneelers! You're long-time parishioners, I take it — three generations?